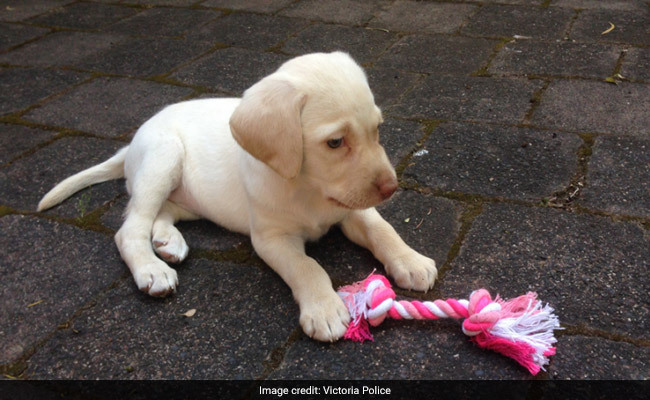 The eight-week-old Labrador pup was reunited with her grateful family but cops still have no leads on the other stolen goods. On Monday, an Australian family was devastated to find that their home in Melbourne had been broken into. Among the things stolen were jewellery and electronics, including a laptop and an iPad. But what upset the family most was the fact that their eight-week-old Labrador pup Sasha was also taken. Days after an emotional appeal to get the puppy back made headlines in Australia, Sasha mysteriously reappeared - returned presumably by the same thieves who had taken her. The family told local media they were "devastated" at the loss of their four-year-old daughter's "best friend." They even appeared on local television, appealing for information to track the stolen dog down. "We're not worried about the material things, we just want the puppy back," Ryan Hood said. Then, on Thursday, a happy surprise as the adorable pup was spotted in their backyard. "We think that whoever took her either has a conscience or got scared and just dropped her over the fence ... we don't care to be honest, we're just glad to have her back," Mr Hood told Channel Nine. Victoria Police said Sasha was "overwhelmed with love and play time" when she was finally united with her tiny human. Victoria Police stated in a press release that while the family was "rejoicing" after Sasha's return, the investigation into the burglary would remain open till the other stolen items were tracked down.